Built on the exclusive, wind free area of Fresnaye, this 7 double bedroom Atlantic Seaboard villa is an absolute dream. 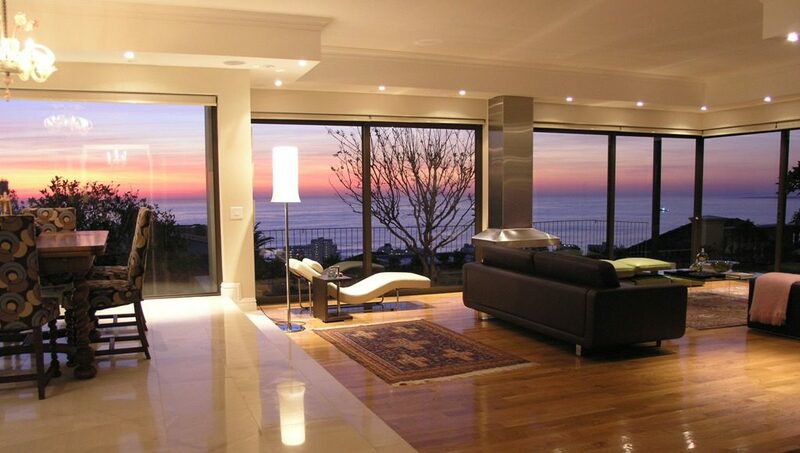 Exceptional views and spacious living with a wonderful garden and pool make this villa unique. 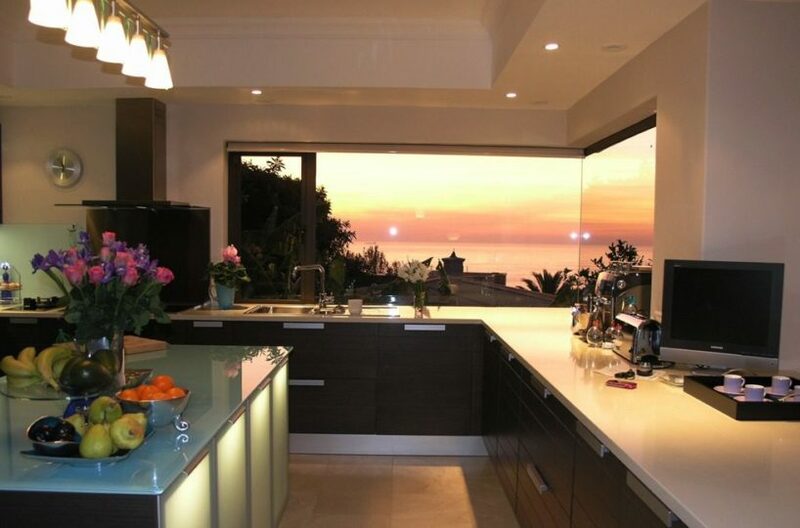 This is a large 3 storey designer home with panoramic views of the Atlantic Ocean, Signal Hill and Lions Head. The property is very private with a large walled garden, huge solar warmed pool and Koi fishpond. 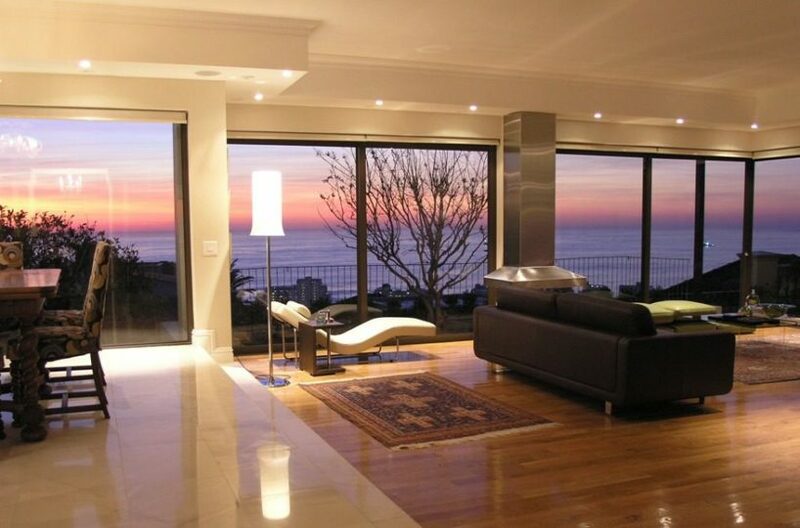 Built on 3 levels there are sea or mountain views from 5 bedrooms and all living rooms. 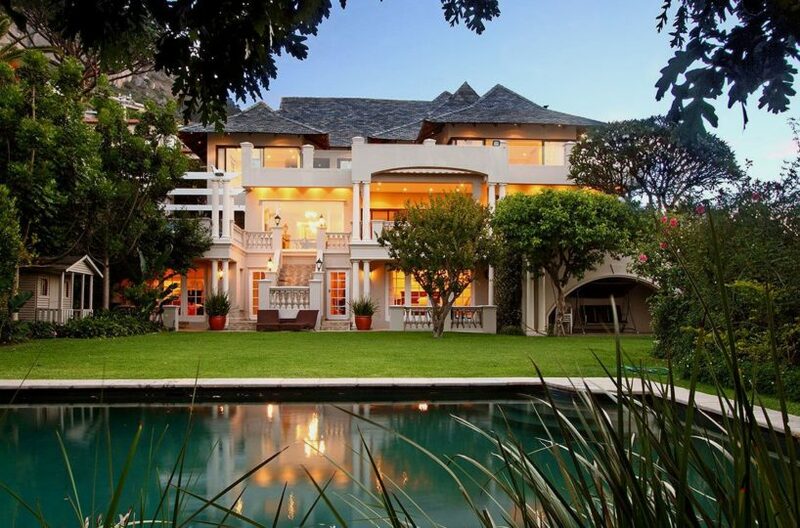 Hamilton House has been featured in lifestyle magazines and has been used for International Film Shoots. Furnishings are a mix of modern leather sofas and antique pieces. 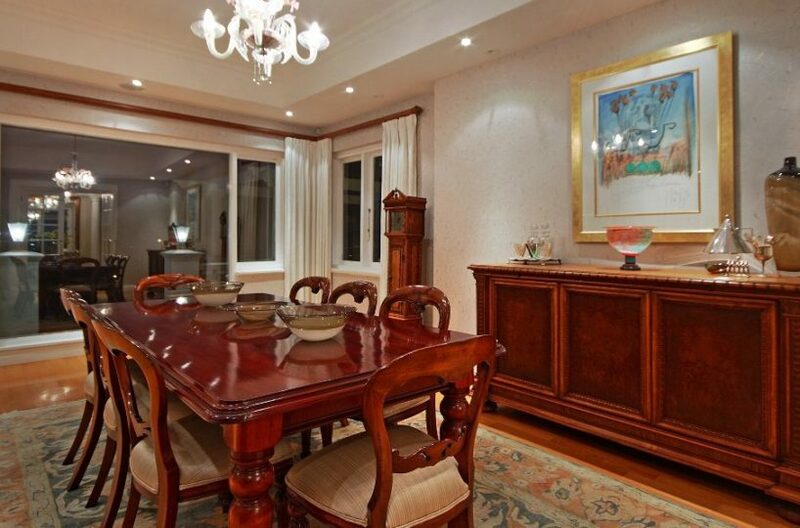 It is very private and secure with a State of the Art Security System. 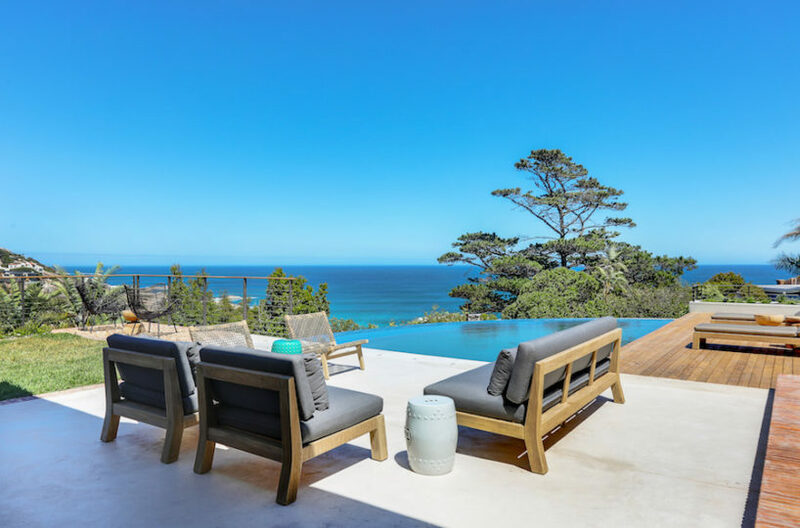 On the middle floor there is a large entrance hall leading through to a huge double volume living space, with wrap around glass walls which open onto a garden and a terrace with sofas and a dining table for those breakfasts overlooking the ocean and suppers on balmy evenings. The terrace has a retractable awning to allow for shady lunches on hot days. 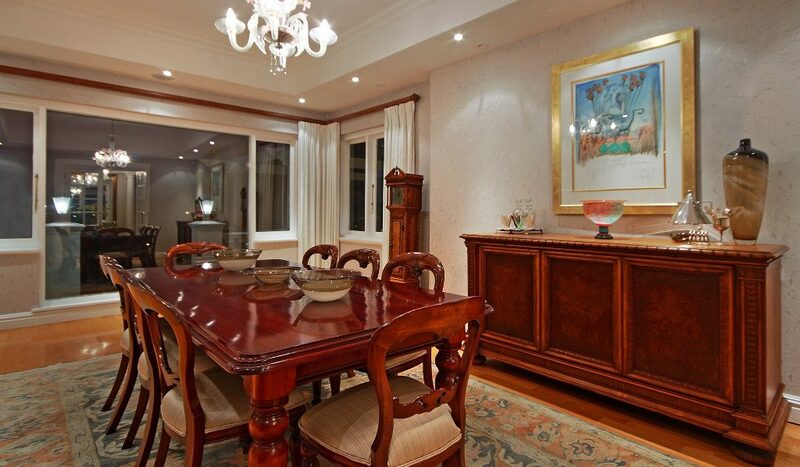 There is a formal dining room with a large mahogany table and a more casual dining room open plan to the kitchen. Main Bedroom has a king size four-poster bed in a very large room with a wall of glass which opens up to a marble terrace. 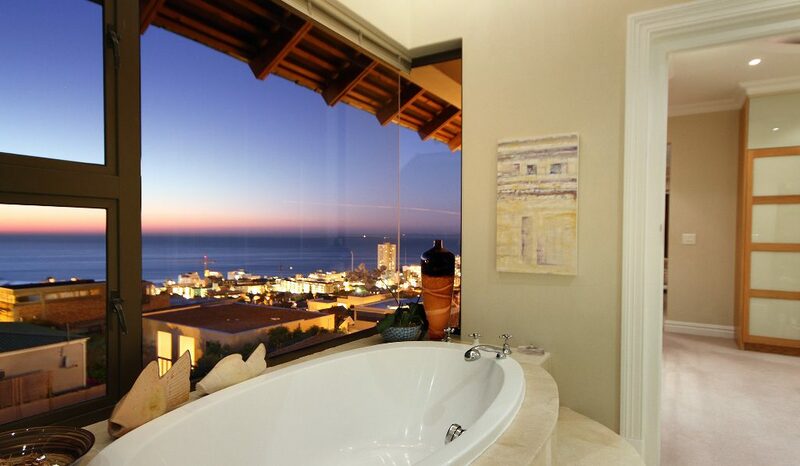 Watch the sunrise over the city from your bed and in the evenings you can watch the sunset too! There is a Flat Screen Television and a Fireplace in this bedroom. 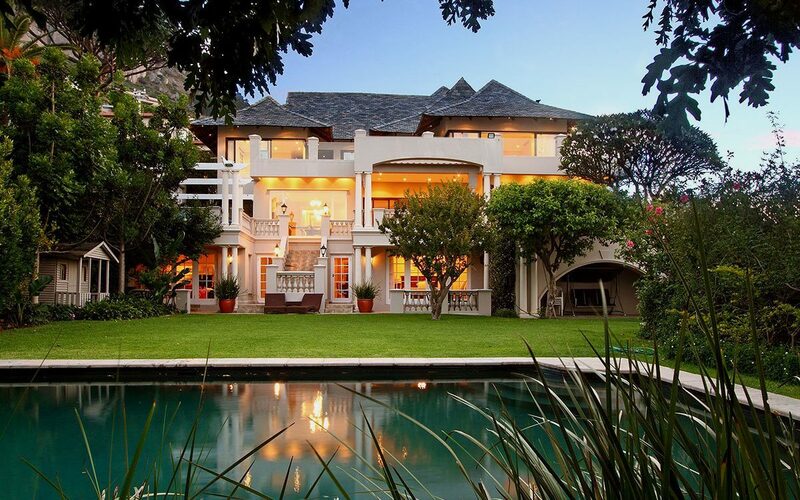 The bedroom leads through to a large dressing room and on through to a marble bathroom. You can lie in the large oval bath and watch the ships sail by with a glass of wine! 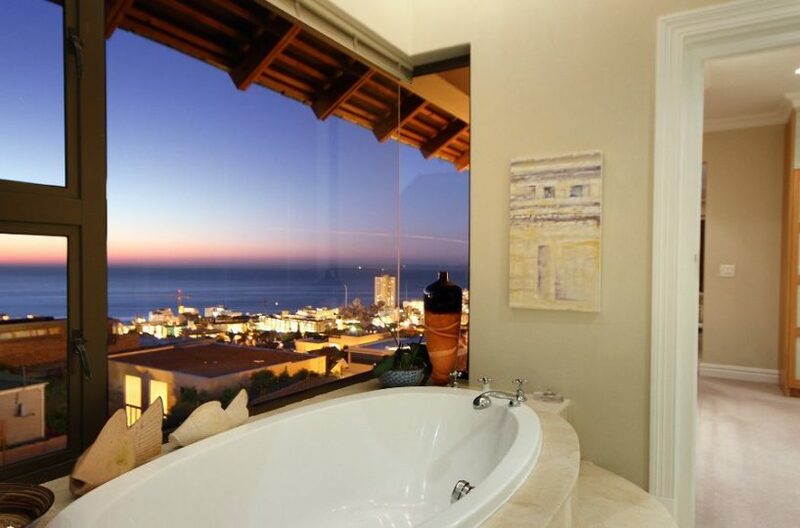 The glass shower also looks over the ocean. 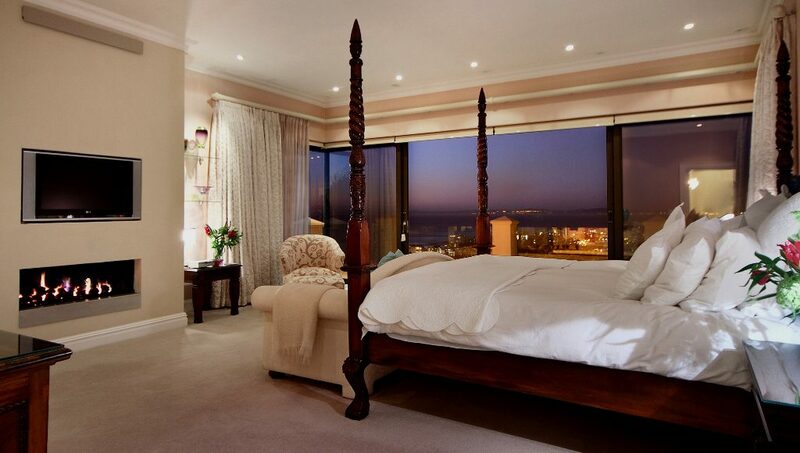 Bedroom 2: Has a Queen Bed, views over the Garden and the Sea. 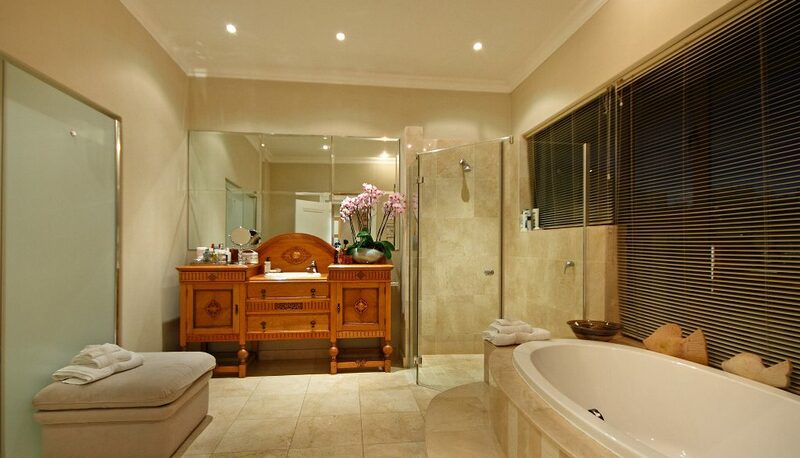 Walk through the dressing room to a marble bathroom with views up to Lions Head. 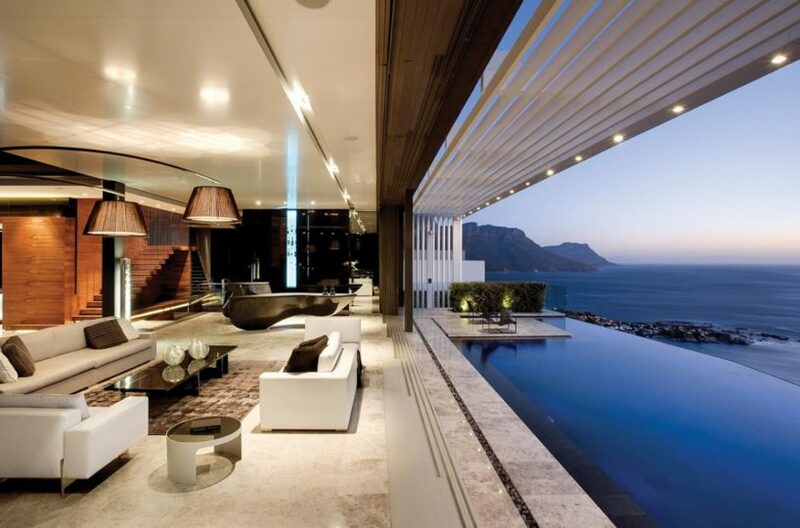 A suspended glass shower makes for stunning mountain viewing! 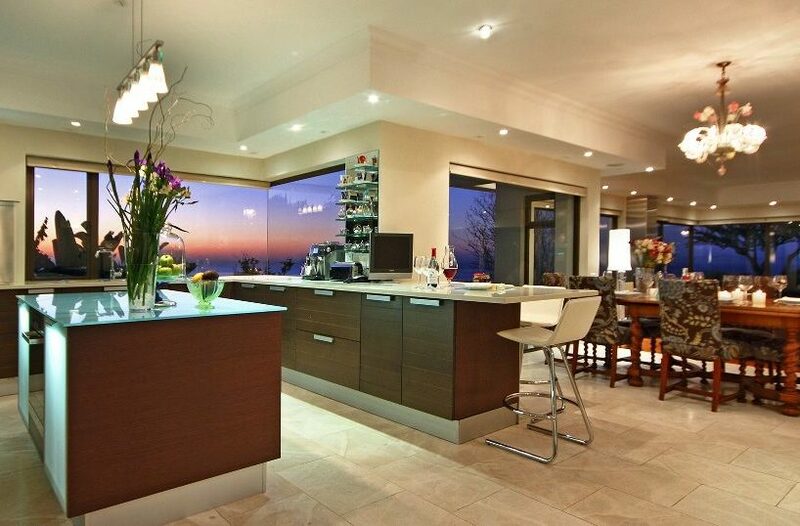 Again glass doors lead out onto the terrace where you can lounge on the outdoor furniture and enjoy the views. 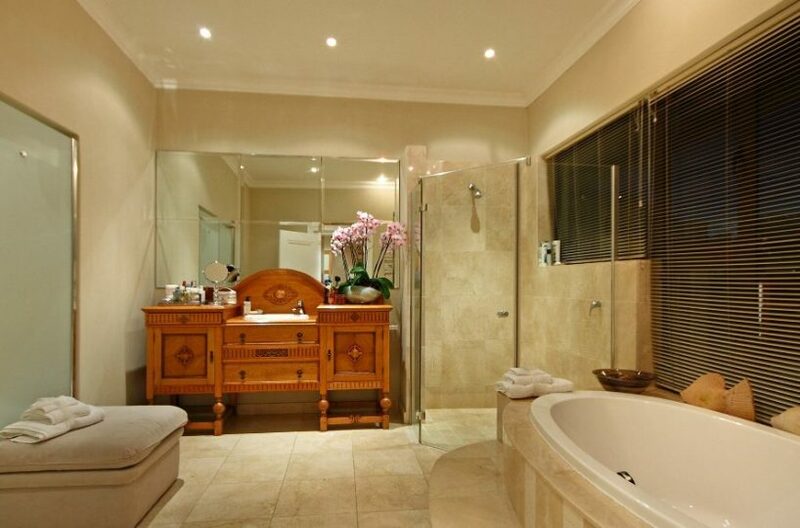 Bedroom 3: Has a Queen Bed, a large walk in cupboard and a marble bathroom en suite, with bath and shower. 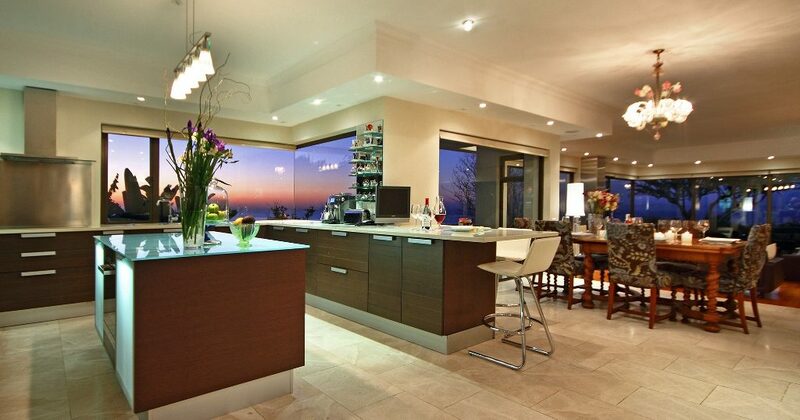 One wall is large glass sliding doors with stunning views and again opening out on to the upper terrace. For longer stay bookings where clients require 2 twin beds, these can be put in this room in place of the queen size bed. Bedroom 4: Has a double bed with a part glass ceiling looking up to our beautiful mountains; there is a marble shower room en suite. The upstairs bedrooms are air-conditioned and the bathrooms have underfloor heating, so you are very comfortable in both winter and summer. From the living area, walk down the oak staircase to a separate guest suite which leads onto the main garden. 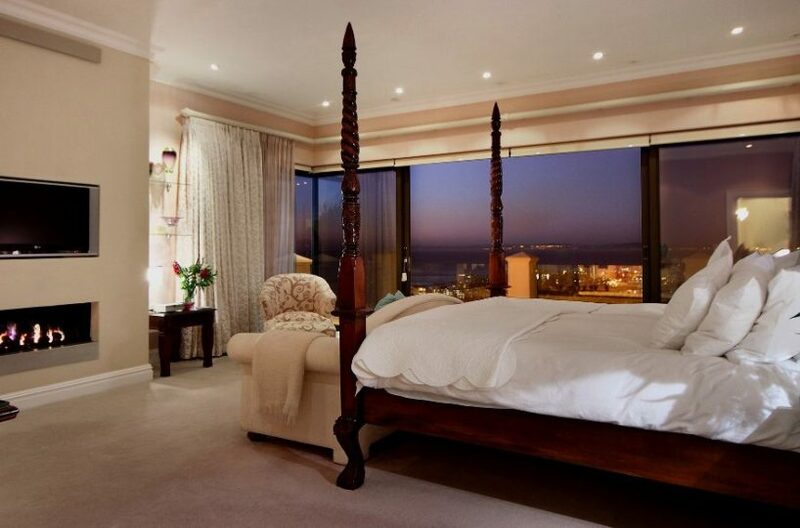 Bedroom 5: Here you have a queen size bed with a walk in cupboard, and a marble bathroom en suite. There is a sitting room with a Flat Screen Television and DVD player plus a Kitchen with Fridge and Microwave in this Garden Suite. 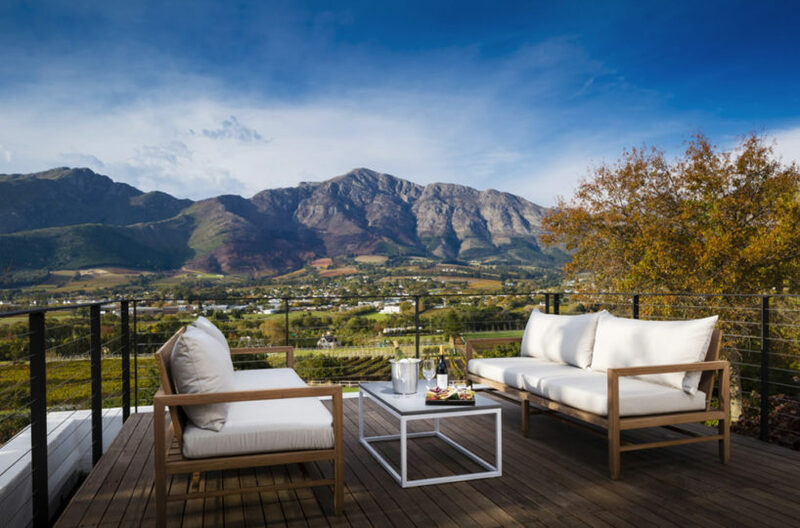 French doors open onto the garden and your own private terrace with table and chairs for a peaceful breakfast listening to the birds in the guava tree. Bedroom 6: This Suite consists of a sitting room with large built in cupboards and French doors leading out to a little private courtyard, with a table and 2 chairs. The bedroom has a double bed and leads into a large en suite shower room with a large shower.